This geographical Map gives a clear overview of Gansu Province and immediate surroundings. including neighboring area's of adjacent provinces of Inner Mongolia Autonomous Region, Ningxia Hui , Shaanxi Province, Sichuan Province, Qinghai Province and last Xinjiang-Uygur Autonomous Region in the far West. Provincial borders are delineated by various colors. The Chinese take the Odd-shape of Gansu Province to resemble Three different auspicious things : Either a swimming gold-fish for its elongated shape with little Fins, Or the Flying Apsarah, the magnificent flying and frolicking "angels of buddhism" from the Marco Polo described Buddhist Caves at Mogao. The Last Shape that Gansu Provinces' outlines may resemble is the Jade RuYi, the S-shaped luxury gift representing the wish of Good Fortune. The Map further provides locations of villages along main roads and railway lines, locations of Monumental and Cultural Historic Sites in the area (includes Great Wall of China locations) and locations of Scenic or Holy Mountains in the region. Gansu counts a large number of Buddhist Caves, Grottoes and Temples, mainly dispersed around Lanzhou and Tianshui in the South-West, along the path of the Hexi Corridor and Silk Road, and in the far West near Dunhuang. The Great Wall of China in Gansu Province is fully described in our Introduction to Gansu Province. In the South-East the Great Wall of China in Gansu Province dates from the Ming Dynasty and has multiple layers in defense of the Cities of Yinchuan in Ningxia and Lanzhou furter South-East in Gansu Province. From these two Capital Cities the Great Wall Defenses of the Ming Dynasty further extend along the Northern Edge of the Hexi Corridor to End up at the Fortress of JiaYuGuan, the Last Fortress on the Ming Dynasty Great Wall of China with its nearby "extended arm Great Wall" the last corner of the continent-wide Bastion. The Great Wall of China does not end at JiaYuGuan however. During the Ming Dynasty a line of Fire Beacons extended the reach of safety even further along earlier remnants of Great Wall. 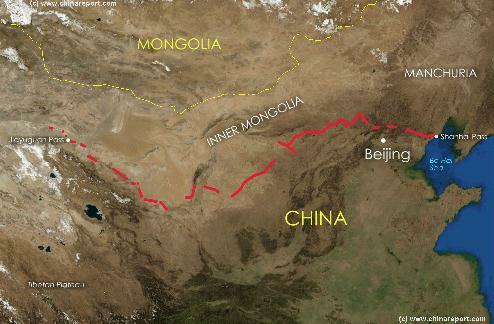 The Han Dynasty and Tang Dynasty Great Wall remnants extend far further West to Dunhuang (Blazing Beacon), on the border of Xinjiang-Uygur Autonomous Region. Located outside of Dunhuang are the Yu Men Gate and Toll House and the Famed Yang Guan Pass first established under the Han Dynasty. From Yu Men stretches of Great Wall remnants (now endangered) stretch even further to have a final end at (former) Lop Nur (Salt Lake) and its marshes in (East) Xinjiang-Uygur Autonomous Region. Link: Satellite Image with Schematic of the Location and path of the Great Wall of China during the Ming Dynasty. Passes on the Great Wall, including those of the Han & Tang Dynasty Era are depicted. Compare Maps for better Comprehension. Click through for more Information on each Location & Subject !